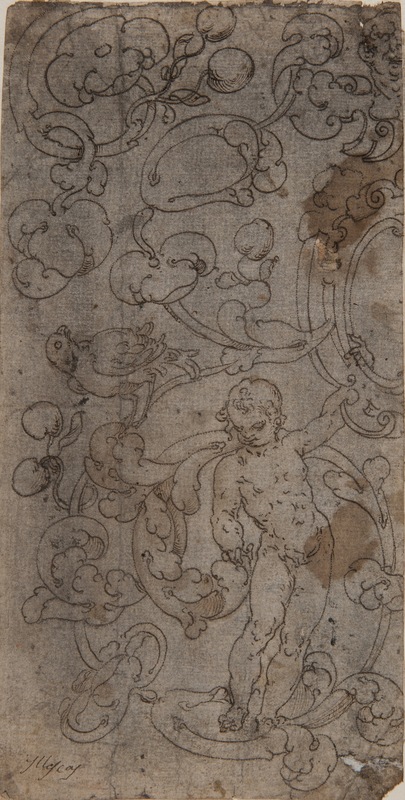 The four drawings presented here depict decorative elements of a Renaissance type, comprising scrolls with intertwined putti, birds, fruit and flowers. However, the muscular forms of the putti and the pronounced C-shape of the scrolls suggest that they should be located within the context of the Mannerist decoration produced by the studio of Raphael. A group of Italian engravers associated with that studio, including Giovanni Antonio da Brescia, Marcantonio Raimondi and Agostino Veneziano, made prints based on a series of ornamental motifs that functioned as models for decorative painters. 1 These images circulated widely among Spanish artists, who kept albums of drawings and prints of different origins in their studios, obtaining from them a rich repertoire of ornamental motifs for use in their compositions. 2 Nonetheless, the simplicity of the present designs suggests the Counter-reformatory period, when complex decorations of grotesque motifs ceased to be used in Spain and were replaced by scrolls, putti and birds. With regard to the attribution of these sheets, they clearly reveal two quite different hands. The sketches of Foliate Decoration and a Bird, Decoration with a small Angel and a Bird and Decoration of Scrolls, Putti and a Bird reveal the same refined and elegant style, with a precise draughtsmanship, light washes that define the shadows, curling, fleshy leaves and detailed figures of the birds. In contrast, the Decoration of Scrolls and Putti is in a different style, with less naturalistic figures and a coarser handling of the pen and application of the washes. Nonetheless, the foliate forms have a marvellous voluptuousness, with twining forms from which hang fruit and flowers. That drawing is also interesting in that it presents the same design in two different sizes on the same sheet, a larger version and a smaller one, which has an extra scroll at the bottom that is mid-way between a human and a plant form. The four sheets are thus by two different artists who were probably inspired by Italian drawings or prints in their creation of the decorative motifs depicted. The clue to obtaining further information on these drawings lies in the short inscription on two of them, which reads “Illescas”. Both the ink in which it is written and the handwriting is contemporary with the period of the drawings, suggesting that it refers to the place in which they were executed. In 1603, at the height of the Counter Reformation and during a period that saw a return to classicism and decorative simplicity, El Greco was commissioned to produce the high altar for the church of the Hospital de la Caridad in Illescas (Toledo). 4 In its present state the altar is notably altered and the few original elements that survive have been severely modified. 5 Nonetheless, we know that its design was similar to El Greco’s two previous altarpieces produced in Toledo, one for the church of Santo Domingo el Antiguo (1577-1579) and one for the Chapel of San José (1597-1599). They both deploy a markedly simple architectural design for the altarpiece, almost devoid of sculpture and conceived in terms of a frame for the canvases that they surround. Both, however, make use of decoration with foliate scrolls and small angels, of which the decoration in Santo Domingo el Antiguo is in high relief while that in the Chapel of San José is painted. A careful examination of the high altar in the Chapel of San José also allows us to perceive very similar decoration to that found in the present drawings. On the lateral pilasters, which may be by El Greco but which may have been executed later, in 1613, 6 are fleshy, intertwined acanthus leaves from which hang fruit and flowers and which enclose playful small angels, all decorative motifs that are notably similar to the ones seen here in Decoration with Scrolls and Putti. In addition, the frame for the canvas of Saint Joseph has large leaves that seem to function as stalks from which hang fruit; decorative motifs similar to those in Foliate Decoration with a Bird and Decoration of Scrolls, Putti and a Bird. It can thus be assumed that while in the present day, scrolling decoration of the type found in these drawings is not to be seen in Illescas (bearing in mind that the Hospital de la Caridad was seriously damaged during the Civil War), it is likely that it was to be found there in the past. While it has also been suggested that these drawings are designs for the decoration of chasubles, the suggested connection with Illescas could mean that these sheets were drawings produced by assistants in El Greco’s workshop around 1600 and that they were used as models for the pictorial and sculptural decorations of the altarpieces into which his canvases were inserted. Ávila, Ana, Imágenes y símbolos en la arquitectura pintada Española (1470-1560). Barcelona, Editorial Anthropos, 1993, p. 40. Various Authors, El siglo del Renacimiento. Madrid, Ediciones Akal, 1998, p. 25. Carofano, Pierluigi, “Francisco de Urbino y la decoración de la celda del prior” in Los frescos italianos de El Escorial [coord. Mario di Giampaolo]. Madrid, Electa, 1994; and García Frías, Carmen, “Francesco da Urbino” in Dibujos italianos para El Escorial. Madrid, Nerea, 1995, pp. 61-83. Marías, Fernando, La arquitectura del Renacimiento en Toledo (1541-1631). Salamanca, CSIC, 1985, pp. 111-114. Álvarez Lopera, José, El Greco. Estudio y Catálogo. Catálogo de obras originales: Creta, Italia, Retablos y grandes encargos en España. Madrid, Fundación Arte Hispánico, 2007, pp. 197-200, figs. 114 and 115. There is a degree of debate as to whether the lateral pilasters and the cornice are by El Greco or were added later, in 1613. See: Álvarez Lopera, José, El Greco. Estudio y Catálogo. Catálogo de obras originales: Creta, Italia, Retablos y grandes encargos en España. Madrid, Fundación Arte Hispánico, 2007, pp. 185-186; Marías, Fernando, “Un retablo de Alonso Carbonell atribuido al Greco y una hipótesis sobre los de la Capilla de San José” in Archivo Español de Arte, no. 199, 1977, pp. 323-327; and Marías, Fernando, La arquitectura del Renacimiento en Toledo (1541-1631). Salamanca, CSIC, 1985, p. 110.